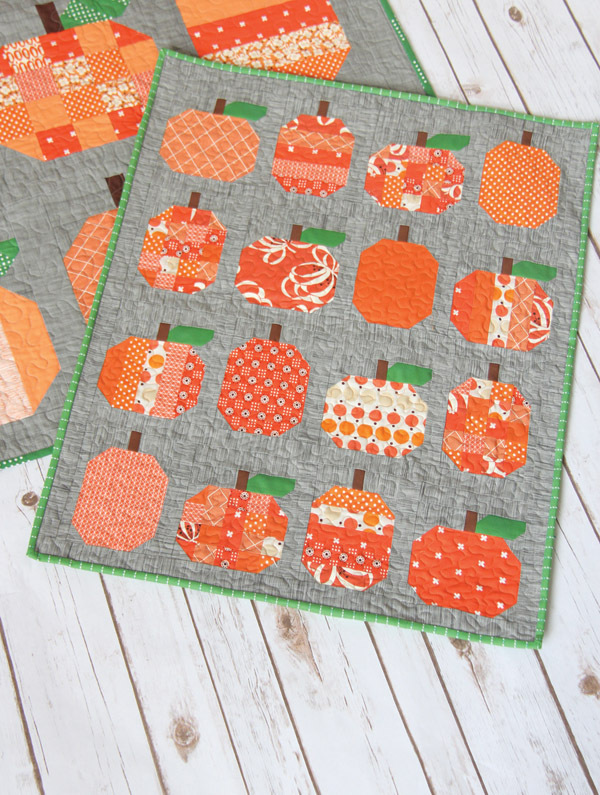 It’s no surprise that I could hardly wait to make a mini version of the Pumpkins pattern! I decided to make this mini a little bigger than my other minis. It measures 23 1/2″ x 29″ finished, so it makes a perfect wall hanging by itself without being too small. I used the same background as I did with my larger Pumpkin quilt, the Moda Crossweave in Grey Graphite. I thought it might be a little tricky to use with these little pieces, but I starched it a few times before cutting and it prevented a lot of the stretching. I don’t hand bind very often anymore, but it looks so much better on minis. Wonder Clips are my best friend when hand binding! 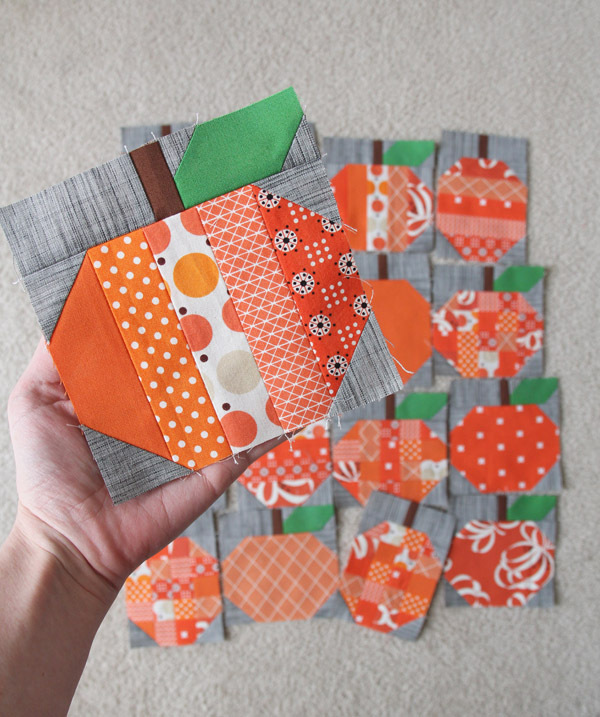 The Mini Pumpkins pattern is in my shop here as PDF, or here as a Paper Version. As always, love your quilts. Love the pic of Jane on Instagram. She is growing “very” fast! 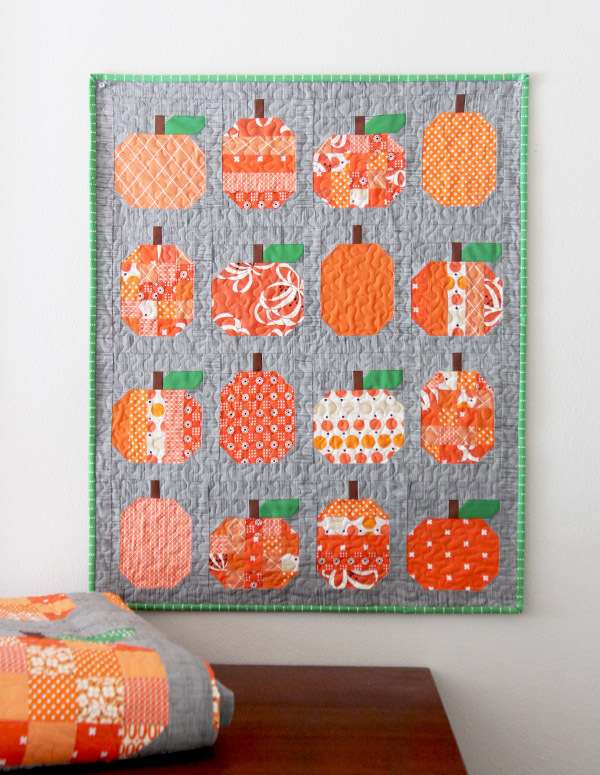 Can’t wait to start working on this mini pumpkin quilt!!! ok I have a total crush on these pumpkins!!!! Love this mini! Looking forward to making it and hanging it up in our front foyer when the Fall season arrives again. It will match the big pumpkin quilts that I finished last year – after Autumn was over :) – so they are now ready to go. Your mini quilt is cute, but it reminds me of fall and I’m really into summer right now. Cute wall hanging. So cute as a mini!! 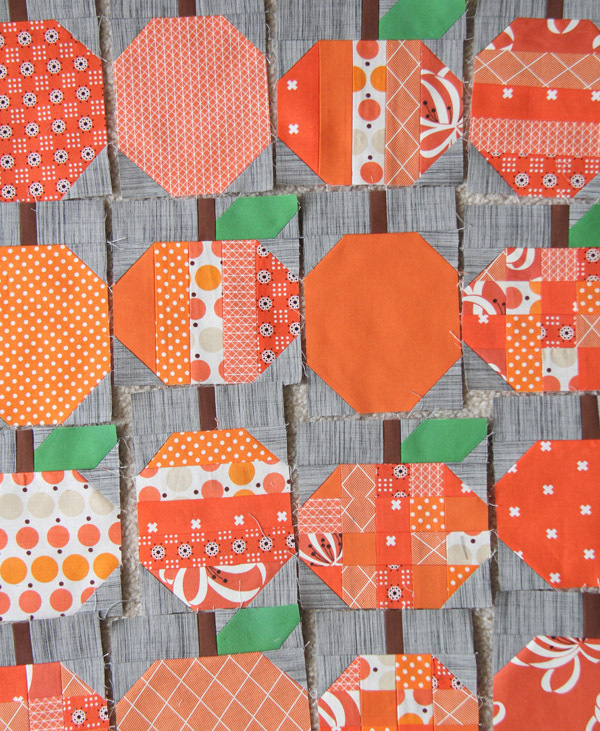 I am sort of working on the full size pumpkin quilt. Maybe by the time this autumn rolls around?! Let’s have summer first. Love the mini quilt. I was thinking ahead to future projects and thought it might be nice to make a pumpkin quilt for my niece. hmmm…wasn’t there a cute pattern on cluckclucksew? 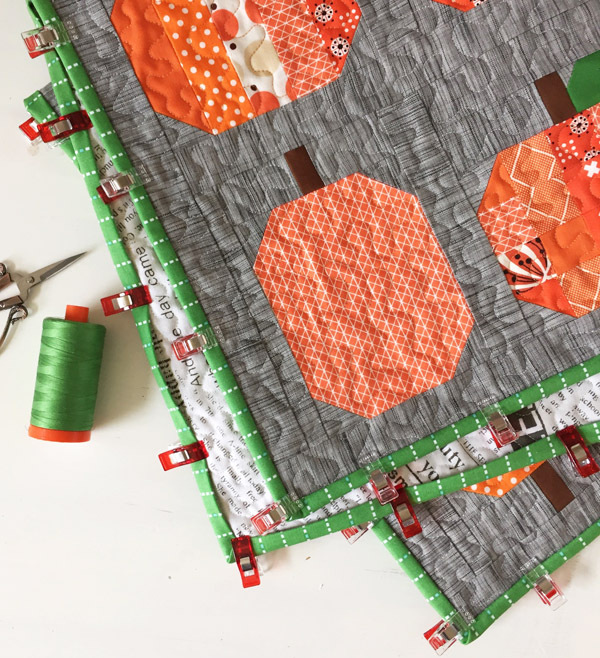 Imagine my surprise when I logged in and saw you had just done another tutorial on a pumpkin quilt! I plan to make it twin XL. The background is moda crossweave in Graphite grey…I think I linked it in the post. Thanks! I just purchased this pattern, are there any pattern updates? This is just a sweet, easy and pretty quilt. I love it.